Lightweight, heavy duty, single piece polyethylene. Filled weight approx. 3,900 lbs. Low profile above ground tank will fit thru 36” doorway access. Storage/re-pressurization of water supply from low yielding wells. 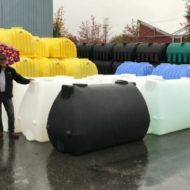 Low headroom rainwater storage for planter /garden use. Standby water storage for fire suppression. Our new Raindrop Tank is listed under our Water/Chemical Tank section.